Up to? - What does it mean? How does Kijoma define "up to" on its network and how does this compare to ADSL/phone line broadband? How ADSL / Phone line services define it. Most if not all Broadband providers declare their service speed as "up to". This came about as originally ADSL broadband used to come in fixed speeds. The fixed speed you got depended on the length and quality of your line and came in typically 512k , 1mbps, 2mbps flavours. Then later on BT decided to allow dynamic speed profiles , they called this "MAX" which as it implies tries to give you the maximum speed your line will allow at the time and adjusts it according to noise and interference dynamically over time.. (This is referred to as BRAS profiling). Once this was provided the modem sync speed you got could vary wildly so the speed was then declared as "up to". To get the fabled 8 Mbps sync speed meant you needed to be very close to the exchange by wire. Even then that still represents 7.15Mbps maximum actual speed. (Due to the overhead of ATM and ADSL). 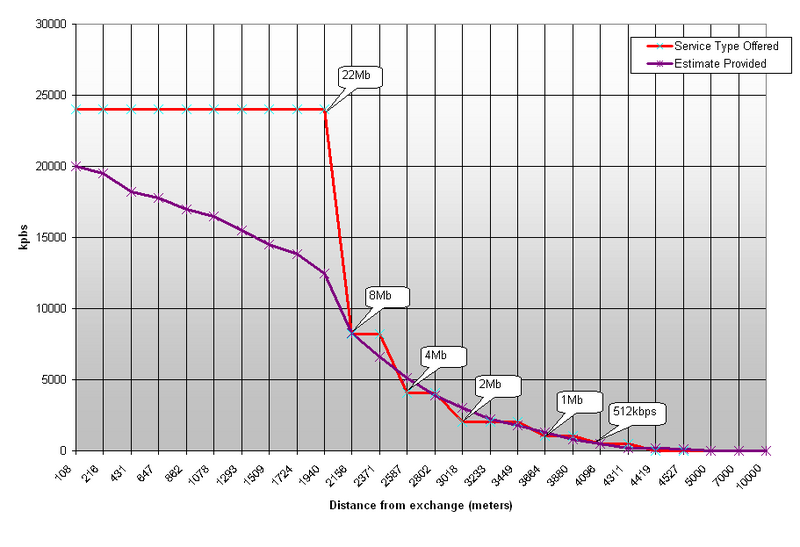 This graph below represents a typical ADSL2 sync speed versus the length of the cable back to your exchange. It assumes your cable is copper , not aluminium and there isn't a load of joins and discontinuities in the line. It also discounts any effects of interference and crosstalk. For ADSL then start at 8 Mbps on the graph. As you can see the further you get from the exchange the less of the ADSL signal makes it to you, the lower maximum speed you will get.. This is the primary limit for speed, however it is not the only limit by some distance (excuse the pun). Once you get to the exchange then the data has to be piped over the BT network back to the ISP endpoint (where they plug their service into BT's network). This is usually done over ATM, ATM is the system used primarily to pass voice calls and has been adapted to handle fast data. This is another potential bottleneck if this pipe has insufficient capacity to feed all the connections using it. Voice traffic will always get first call too. Some exchanges may only have 40 Mbps total capacity . work that out yourself if you have say 200 customers on the end all trying to get "up to 8 Mbps"..
After this you get to the ISP, the ISP has to buy pipe capacity from BT, this usually comes in 155 Mbps and 600Mbps chunks and has a corresponding jump in cost to the ISP. As this resource is expensive then it is in the ISP's interest to get as many customers onto it as possible in order to absorb the cost and make a profit. This often leads to what is known as over subscription or "Stack em high, sell em cheap". The ISP itself of course then has to have sufficient capacity to feed these pipes it has purchased, this is usually less of a problem in these days of relatively low cost fast backbone infrastructure. The last and of course important issue is the "internet" itself, when you visit a website it could be geographically 1000's of miles away, it could also be sited in a "stack em high, sell em cheap" heavily oversubscribed Hosting provider or just be very busy at certain times of the day etc.. So although you may have a motorway to whizz along , if the place you are downloading from is down a B road off this motorway then that will define the top speed to you from that site. If 1000 other people are trying to get down that B road then the trip becomes a very slow one indeed. The other thing which keeps with the road system analogy is that the internet is very much like a road system and during peak "rush hour" when millions of computers are using it then due to the finite capacity there will be a general congestion issue to deal with. Kijoma is entirely an IP network, that means there is no ATM, phone lines or other intermediate technologies to accommodate. The speed you sign up to..
We terminate at high speed Data Centres which have plenty of excess capacity, outside that the internet "cloud" is a big variable out of our control. The technology used to connect you to our network. Kijoma has been providing high speed services since 2005, some of our earlier customer premises equipment had a top speed limit that may not match some of our current high speed services. As part of our continuous improvement program these slower units are being replaced by the latest technology as time and demand for the faster services permits. As with all networks there is a finite capacity feed to each access node on our system, this is always being increased as we ride the technology wave but it will always have a top limit as with ALL systems. Fortunately we do have Quality of Service management on our networks (QoS) and have had since day one. 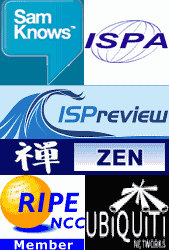 Way before most other ISP's had considered it worthwhile. QoS is not "throttling" as some may think it means, its balancing the load and is a beneficial feature. Could you imagine what the road system would be like without traffic lights, flow control and other "balancing" methods? . it would turn into gridlock and chaos.. Some would get a fast speed, others maybe stationary.. A completely "unfair" situation. This is not to say of course that some ISP's may use it to throttle the speed of high users, or to put them on a "naughty" profile which has low priority.. We do not do this. Which is why we may not have as high a usage limit as many offer but unlike many of those, we do not them throttle you via stealth instead. The different Kijoma services have different priority profiles. We believe that if you pay more for one of our business tariffs then you deserve a higher priority than say our home Light service. As such each tariff has a different overall priority on the QoS system. This is fair as a £14 home service should not hinder a business £27 one if a contention issue was to exist. Likewise for Business plus vs any lower tariff etc..